When this movie was first announced, I was excited. 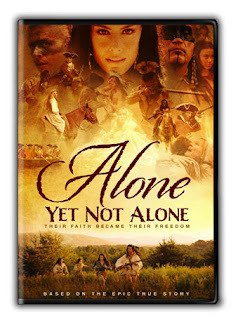 It was a movie set in one of my favorite eras—the French and Indian War! Perhaps it would include the indomitable James Wolfe, the courtly Marquis de Montcalm, or the daring Robert Rogers. Hopefully redcoated British regulars, blue-clad provincials and green-jacketed Rangers would clash with French regulars and painted Indians in epic battles! My sister disagreed with my hopes for the movie. She believed it would be a heart-stirring drama of two sisters who attempt to rebuild their lives in the midst of a war that turns their world upside down. We were both wrong. Alone Yet Not Alone turned out to be neither what my sister nor I expected. This review will go through the movie’s story as well as a little of the history behind it. Because the movie naturally divides itself into two parts, I will divide my review the same way. The year is 1755 and the Leininger family has immigrated into the colony of Pennsylvania. There they purchase land and begin a new life for themselves in the wilderness. They quickly plant crops and erect a house. But trouble is brewing not far away. The pompous British General Edward Braddock dismisses his Indian allies, (against the advice of his superior aide named George Washington) claiming that the British will drive away the French without them. Understandably disturbed, the Indians switch alliances from the British to the French. The history portrayed here is simply absurd. Braddock did not drive away the Indians with his arrogance (for more on this subject, see my series called “The Trial of Edward Braddock” at http://defendingthelegacy.blogspot.com/search/label/Braddock). The Indians did not join the French because they were rebuffed by Braddock; instead the French had built relationships among the Indians, mainly through the fur trade. In council, the Delaware Indians decide to take up the hatchet against the British settlements. Two brother warriors named Galasko and Hannewoa descend on the Leiningers’ home when the mother and two brothers are away at town. 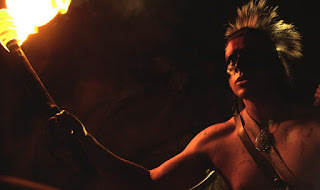 In a brief fight (the most convincing in the entire movie), the Indians kill the father and the last brother before burning the house and crops to the ground. The Leinginers’ two daughters, Barbara and Regina, flee down the creek into a rocky grotto, but the Indians follow in a canoe and succeed in capturing the two sisters. Barbara and Regina are marched through Pennsylvania to Fort Du Quesne, but they are separated when the war party they are travelling in breaks up. Regina is sent with one group of Indians while Barbara remains with another group. Barbara is heartbroken, so when an opportunity to rejoin Regina appears (in the shape of a horse), she takes it. Headlong she plunges through thickets in a vain attempt to find her sister. But she is quickly recaptured and sentenced to death. Help arrives from an unexpected source when Galascow intervenes, praising her courage. The Delaware Indians make a journey to a French fortress called Fort Du Quesne. The scenes in Fort Du Quesne are some of the most visually beautiful in the entire movie. Compagnies Franches de la Marine and French militia garrison the fort as war parties of Indians pass through its gates. The year is 1756, a year of success for the French and Indians in their war against the British. Eventually Galasko and his band leave Fort Du Quesne and settle into the village of Kittanning. Unbeknownst to Barbara and the Delawares, the Pennsylvania Assembly has finally voted to raise money to fight the French and Indians. The Quakers had not wanted to raise money for the military, so a band of irate Scotch-Irish and German settlers marched on Philadelphia. A circumlocution is introduced into the militia bill, agreeing to appropriate money “for the King’s use”. Because the Quakers are not voting to raise money for war, they reluctantly agree, and the bill is passed. John Armstrong is appointed to command the militia of Pennsylvania (at least those west of the Susquehanna River) (2). Their first target is the Indian settlement of Kittanning Village. Colonel Armstrong (not Captain; he was promoted in March of 1756) and his raid on Kittanning are true pieces of history; however, they are poorly portrayed in this movie. First of all, Kittanning Village was a collection of about 30 log cabins, rather than the birch-bark wigwams shown in the movie. The raid actually began shortly after dawn, rather than in the afternoon. The Pennsylvania militia is shown as suffering most of their casualties from hand-to-hand fighting. Actually, the Indians positioned themselves in their cabins and engaged in a firefight with the militia. In his report, Captain Armstrong observes that "they seldom missed of killing or wounding some of our people." (3) The tables finally turn for the Pennsylvanians when they light the cabins on fire, causing them to explode because of the large amounts of gunpowder stored within. That would have made an interesting scene for the movie! As Kittanning Village burns, one of the captives named Lydia attempts to escape with two captive children. She is caught (but the children are found by the Pennsylvanians) and sentenced to die by being burnt at the stake. Some time afterward, a French officer and his men arrive on the scene. This officer is attempting to conduct this war honorably, and torturing a prisoner is dishonorable. He is an important character in the movie, for he provides a counterpoint to the official in Fort Duquesne who is buying scalps. One conducted the war savagely, the other honorably. Yet the character of both were represented in the French military during the French & Indian War. To cite merely one example, Governor-General Vaudreuil meticulously counted the number of scalps brought in by Indians and sent that information to the Minister of Marine in France, while General Montcalm risked his life to save the English (his enemies) from the Indians (his allies) during the Fort William-Henry massacre. Galasko, Hannawoa, Barbara and the rest of their Indian band return to Galasko’s village of Moschkingo. There Barbara and her friend and fellow-captive Marie settle into the ways of life there. Some characters that I believed did an excellent job in their roles include Lydia the English captive. She is an excellent motherly presence to this group of captured children. Barbara’s scene where she attempts to escape on a horse is another well-acted scene. The French lieutenant is devout and honorable, while Galasko and Hannowoa provide an interesting contrast to each other. The movie makes a natural break here, as young Barbara (Natalie Raccosin) becomes Barbara (Kelly Greyson). I would rate the first half of the movie 3/5 stars. Lydia and Fort Du Quesne are some of my favorite parts, but the erroneous portrayal of Braddock and the Kittanning raid bring the score down to 3/5. My next post will tackle the second half of the movie, with Kelly Greyson in the lead role. I'm glad you took this movie to task for its historical deviations. I didn't know much of what you pointed out. Looking forward to the next post!